THE ROAD NOT TAKEN: You've Got a Friend . . . .
You've Got a Friend . . . .
An old proverb says that "one friend in a lifetime is much; two are many; and three are hardly possible." Not true! The truth is that starting from when we were little children and continuing to this very moment good friends have had a way of coming in and out of our lives at every turn. First came our childhood friends, than our high school and college friends, than our work friends, the friends that come through family associations, our community service to others, and than came the friends after that, and on it goes. While it is true just one, two or three of these friends come to stay forever, while the rest have come and gone. Each and every friendship, however brief brings a lasting and priceless gift if we only take the time to stop and look for it. 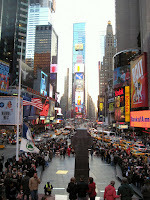 For me it has sometimes seemed like I am Time Square New York! I stand in one place as so many people pass in and out of my life. We spend special times together during the chaotic interim until it is time for them to board their bus or catch a taxi or hop a subway train. O! yes sometimes the farewells are sad but while we are standing at those crossroads what a time we've had! Think of all the wonderful people in your own "Time Square" life and be happy for them, honor them. What a time you've had! Don't wait for tomorrow to tell them how you feel. Let them know today . . . . You've got a friend.